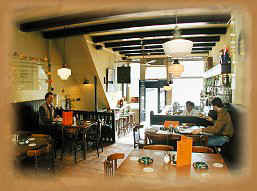 Bruin cafe; A typical Dutch restaurant, usually filled with locals, are the so called ´bruine cafes´ (brown cafes). The name of this type of cafe originates from the nineteenth century when people used their living room as a café in order to make some extra money. Dutch brown cafes started to look like living rooms; small, cosy, brown interior and dimmed lights. This type of cafe is suitable for a simple coffee or a soda. The brown cafes are in comparison to the other cafes the cheapest to have a drink. A regular coffee costs around €1, 50. Beside a drink it is also possible to have a small snack, such as ´bitterballen´ or a ´tosti´. Lounge Café: A trendy café where people sit or lie in a relaxed atmosphere. This type of cafe opens late at night and is not very suitable for lunch or dinner since there is often no food being served but nuts or nachos. Drinks are often cocktails and can be expensive, ranging from €5 to €12. The music played at this type of cafe is lounge, jazzy or funky house. Grand Cafe: This type of cafe is named a grand cafe, simply because it is a big cafe. A grand cafe often has a terrace and unlike countries such as Spain or France, you pay the same price inside as you do outside. A grand cafe often offers a wide range of international cuisine (breakfast, lunch and dinner). The prices are average, €2 for a beer and approximately €15 for a main course. Eetcafe: The perfect cafe to eat cheap and cheerful as an ´eetcafe´, a cafe where you can have lunch or dinner for a good price. Don’t expect haute cuisine, just simple and tasty food. A lot of locals eat at an eetcafe and it has an open and relaxed atmosphere with various types of music which makes an eetcafe worth a visit. Internet café: Amsterdam has many internet cafes, where you can surf the internet for a good price while enjoying a drink. There is no food offered except for some small snacks, such as candy bars. The best option for a cheap internet café is to go outside of the centre, like Kinkerstraat, where you have tons of cheap internet cafes. Check out our listings for our selection of the best cafes!